My fidelity to the magisterium, my defense of the clergy, are well known here. However, it’s time for a family talk. Today at the City Council hearings to determine the fate of our CPC’s and PRC’s, our Bishops, Priests, Deacons and Religious, all save one, were nowhere to be seen. The Bishops were all at their conference, and this is understandable. One priest showed, Father Peter Pilsner, and we were so very grateful for his presence and testimony. However, before Father Pilsner arrived, many were noting how our leaders had let us all down. It is understandable that longstanding commitments would have interfered with stalwarts such as Fr. Frank Pavone. But there are so very many who claim to be with us, and when we needed them most, our leaders were missing in action. Again, praise God for Fr. Pilsner. I was livid, and I’m not ashamed to say so. Leadership means you take the tough assignments, the really, really tough ones like today. And today, our priests and religious (again, with the exceptions of those mentioned) let us all down. Were some afraid that it would make the pro-life movement look too Catholic? Sorry to disillusion some, but that Genie is already out of the bottle by about 38 years. Besides, why not have the upholding of the sanctity of human life be solidly identified with the Church? This atrocity will end some day, and then we will take stock of who stood and were counted. It is in the interest of the Church to be very visible. Our involvement actually hinders the opposition, as strength and unity on our part strike fear into these people. Today belonged to the laity, tragically. Such abandonment is corrosive and fosters an “us vs. them” mentality. This must never, NEVER happen again. Our laity were splendid today, as was Fr. Pilsner. It would have been great for him had he the company of brother priests, deacons, and religious. I’m not just having a dig here Dr. Nadal, but is it possible they realise it’s a lost battle and their presence may merely cause people to nod their heads knowingly and mutter “out of date church”? Can you see that being a possibility? Here, too, we have very few clergy join us in our pro-life efforts. It actually makes me wonder if many of the priests have skeletons in their closets. Face it, they all have pasts that may be not the best, and perhaps they have an abortion in their past that makes them ashamed to come out in the pro-life movement. I fear that this may be so, given the fear that cripples the clergy. Thank you so much for your prayers. Without them it would be impossible to move forward and do this work. I see your point and find it ironic. The biggest and most authoritative voices in the movement are the post-abortive women and men. They need to get over their fear and be bold, as the Apostles and martyrs were bold. It matters not what they think about the cause. So long as we are willing to go out and fight, and believe me when I say that yesterday was all-out war, then they need to be there. Also, in matters such as this, you don’t fight because you think you have an immediate advantage, because victory seems assured. You fight because it’s the right thing to do, because 3,000 babies are going to be slaughtered that day. You fight for them. You don’t just shrug and walk away. And, you fight for the people in the same trench as you. Yesterday, our clergy and religious sat this one out, and for those without previous and unavoidable engagements, that is simply inexcusable. They are a great source of comfort and strength for the lay leaders in the movement. They will be less and less so if this becomes routine. Your collection of information concerning the rate of “induced terminations” rather, abortions, and your efforts at City Council are courageous and inspirational. Thank you for everything you are doing. I was very interested in attending the city council hearing and I investigated the internet for the time and location of the hearing. Finding the council hearing information was intimidating and almost incomprehensible. And I enjoy the internet and spend too much time on it. My limited experience with clergy is that they mostly spend their time being in-person with others. If you relied on Facebook and your blogs to recruit clergy, you might have had a very restricted pool of people who might have known what was happening. Of those who did know, taking 3/4 of a day out of all of their responsibilities to attend a 1:00 hearing might have been impossible. Leaders almost always begin alone, clearing the path that others may follow. Thank you for seeing and creating the path that others will follow. In my own diocese, we have priests that are spread thin and don’t have enough time in the week to attend everything they’d like or be everywhere we’d like them to be. But I’m not sure what the deal is in your diocese. Our deacons are helping to fill in some gaps, but there is still more harvest than workers. I think this goes right back to the “family” if I might say so. How many families live their faith in an open way and faithful to the Magisterium? Very few. How many families pray for vocations and have children enough for God to “call” a child to the religious life? Again very few. That’s where are priests are. They are the aborted and contracepted babies who are gone. In my tiny parish we have 3 religious vocations – all from large families who home school and attend Mass on a regular basis. Our parish is THE only one in the city with vocations because we have a priest faithful to the teachings of Christ (many have left over birth control and abortion) and all the home schoolers and trad. Catholics attend Mass here. The living God is at work in this parish because He is allowed to reign in the hearts and minds of these generous families. 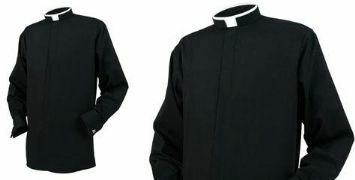 on November 17, 2010 at 7:19 PM L.
I am willing to pray for men and women to fill the shirts. “Also, in matters such as this, you don’t fight because you think you have an immediate advantage, because victory seems assured. You fight because it’s the right thing to do, because 3,000 babies are going to be slaughtered that day. You fight for them. You don’t just shrug and walk away. And, you fight for the people in the same trench as you.” G.N. I’ll reiterate…..you fight because IT’S THE RIGHT THING TO DO!!!!!!! I am so sad to hear about the lack of priests there. I have to say that it also runs deep in the evangelic areas too. Abortion is a very hot topic and a lot of these priests and pastors do not, I repeat do not want to get involved. So with that verse in the Bible, he will hold people accountable for all of this. Maybe Julie hit a good point, there may be an abortion in their past and to painful to deal with it. They need healing! Gerry, my heart goes out to all who are fighting this fight!! I know it may be coming down the pike to us!! I’d be inclined to agree with Ninek if the area you were talking about wasn’t NYC but a smaller area such as where I live. Our orthodox young priest has done a splendid job of increasing Mass attendance from 1100 to 2000 in three years, and that’s with his being very outspoken and supportive of doctrine, especially the ones that make people uncomfortable. But he is IT – he has no supporting priests, and only one day off. He’s in the office or at the hospital where he is the RC chaplain well into the evening, and, of course goes to the hospital at all other hours. (A parishioner was telling me yesterday that often when Fr. is at the hospital, non-Catholics will ask him for prayers and he obliges.) Plus, he has a school to run. So although he is passionately pro-life in all areas, he simply would not be able to attend such an event if it were local. But there are so very many priests and brothers in NYC that it’s inexcuseable that only one attended. I was the director of a preganancy help center, and spoke to churches, and community groups. I always spoke of the pressures inflicted upon the woman, and the man involved in the decision for an abortion. As an individual, standing in front of people, I looked them in the eye. Many could not look back. Many hurting people out there. I think that priests could do their part by preaching the truth at Mass. I have been Catholic for 30 yrs, and can count on one hand the times I’ve heard even the word abortion mentioned in a homily. Never much more than a sentence or two. If people are taught the truth, offered the hope of healing, in the setting of Mass, surrounded by the Body of Christ, they will change their hearts of stone to hearts of flesh. I learned from Msgr. Reily of the Helper’s of God’s Precious Infants that reaching the hearts of the women, and men, in prayer and compassionate reaching out to them is a key to ending abortion. Yelling at them doesn’t help. I became Catholic because of the Church’s stand on the pro-life issues. All the other things that I misunderstood took a while to filter through. But the abortion issues held me there long enough to get me through the questions. The Church is the Truth of Jesus Christ. We all need to stand up and defend life together, lay and religious. This was a bit of a ramble. Sorry if I lost you somewhere on the way! Hardly a ramble Patrice, and great insights!